Meban's Bridge is about 1/4 mile below the put in. This is a favorite fishing area. Warning. 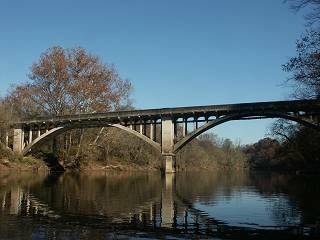 The Duke Steam Station Dam is about 1 mile below the NC Hwy 14 Bridge. The portage is on river right well before the dam. The trail is open and well marked, but the steps are often covered with mud and hard to find. The take out at the NC 700 Bridge is below the bridge on river right.